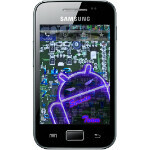 Source code is for modders what chum is to sharks, and Samsung is stirring up the waters in the Samsung Galaxy S II community with the source code for the Android 4.0 Ice Cream Sandwich update. The update has been working its way out to Europe and Asia, and now Samsung has released the source code for it. It should be noted that this is obviously the code for the base version of the Galaxy S II (model GT-I9100), so there are no guarantees that the code will be able to be turned into custom ROMs for carrier variants of the device, like the AT&T Skyrocket, etc. Still, it could go a long way in helping modders create custom ROMs. It could definitely help out Team Douche in its work on CyanogenMod 9, since it has now released what may be its last CyanogenMod 7 (Gingerbread-based) update. yay, hopefully this means I'll get ICS on my at&t gs2 soon! The touchwiz skin for ics looks so disappointing. I would be surprised if the ATT SGS2 didnt get it soon since its pretty much an untouched i9100.. however i have my doubts about the crapdragon enhanced Hercules/Skyrocket/Note american carrier variants. Maybe by xmas? ugh. Maybe samsung is finally getting better with the updates.. one can only hope. I'm a but disappointed at the skin. Still feels like gingerbread. I'm a bit disappointed at the skin. Still feels like gingerbread. That's Samsung for ya they couldn't update the touchwiz just a bit more and give users something to be happy about , like a touchwiz 4.5 since 5 is being saved for GS3. What's with the moderators at PA ban this individual spamming articles with hate speech already??? ?